Are you fascinated by Bohemian decor style? 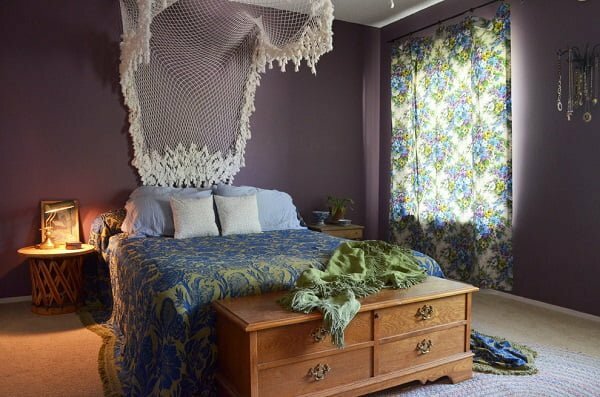 Want to create your own boho bedroom? 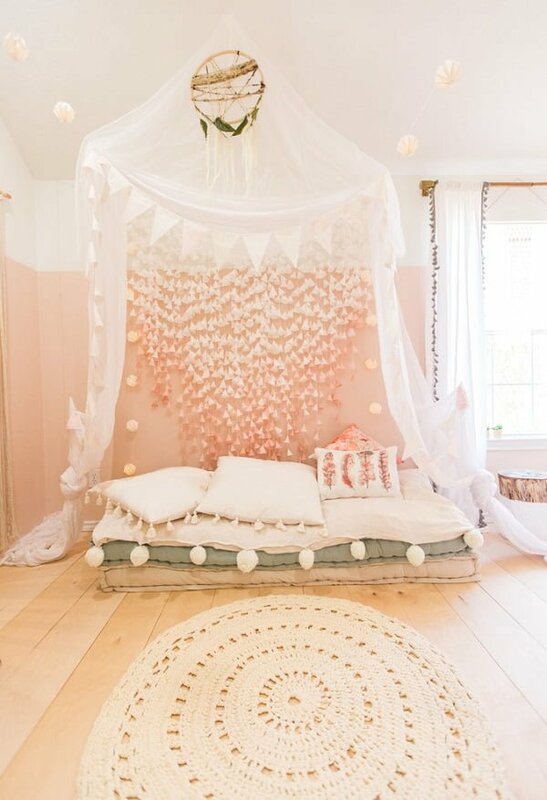 Here are 20 dreamy ideas that you can DIY in this style. 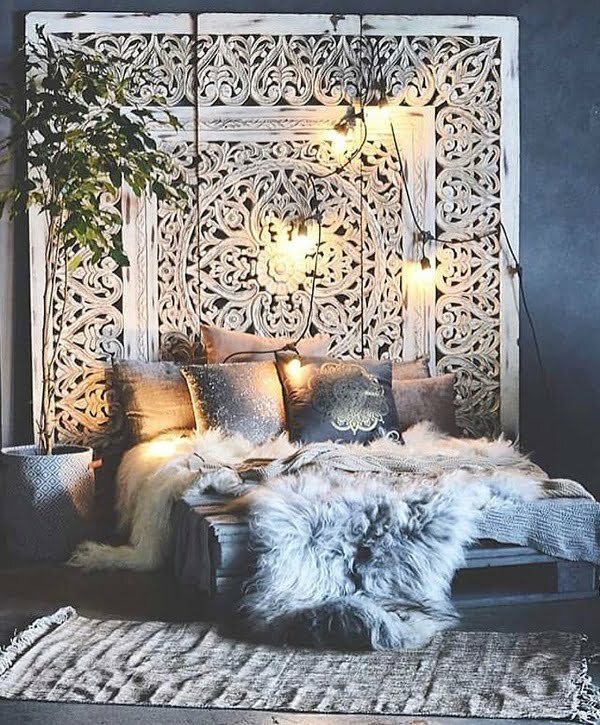 Bohemian decor style is famous for its use of eclectic design elements, lots of patterns and textures, and at the same time the use of cozy (even rustic) accents. That means vibrant colors, a lot of fabrics (with generous use of macrame and tassels), a lot of natural wood and vintage items. Everything that helps you portray your personality and add character to your decor works in boho style. 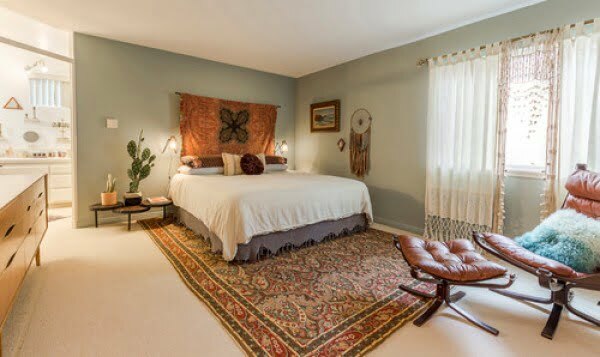 The boho bedroom is the most popular place where this style is used prominently. It’s your nook, your getaway place of serenity where you can relax after a hard day. At the same times, it’s the place where you want your artistic side to flourish. That’s where boho can show its best side. 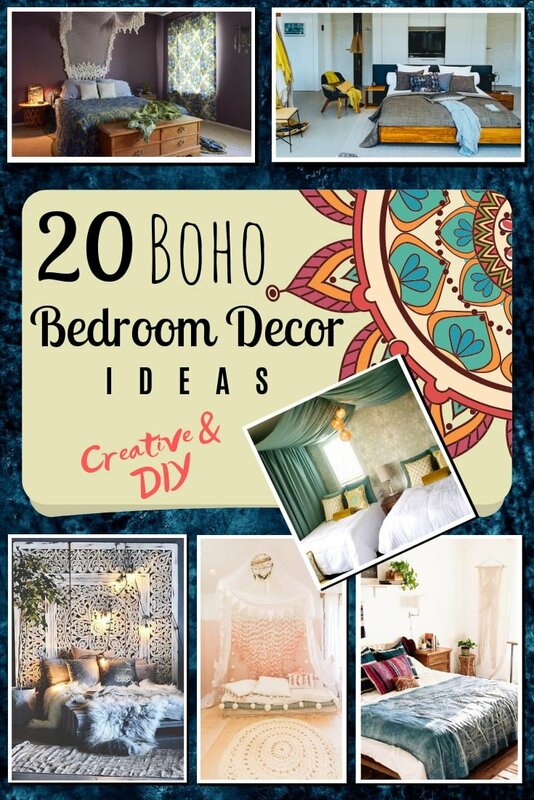 And to help you with that, we’ve come up with the most creative boho bedroom ideas that will inspire you to DIY this style at home. This boho bedroom features an oversized ornate headboard in a vintage look. The bed is made from pallets which only adds to the Bohemian vibe. It’s finished off with string lights which are a staple of boho decor. 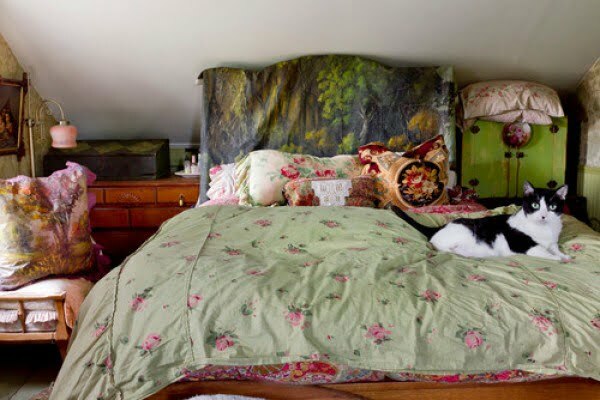 You can add faux fur blankets or laces carelessly draped over the bed for the complete personal look. Woven wall hangings have long been the staple of boho decor. If there’s one accent in this style that you’ll add to your bedroom, it’s this beautiful piece of wall art. It always gives the room a cozy accent and a lovely pattern. Combine it with some Bohemian style pattern fabrics for the bedding, and you get the complete look. 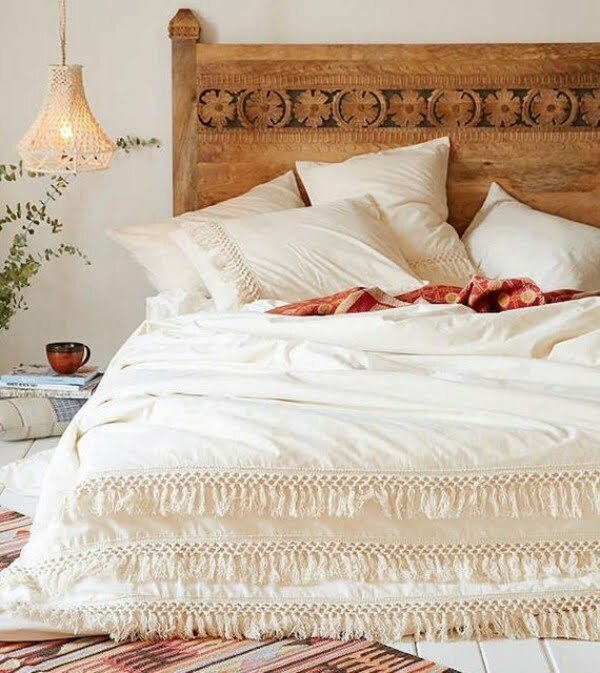 Since we’ve started talking about the bedding, here’s one option to create a boho accent in your bedroom. These duvet and comforter covers in an eclectic pattern will give your bed-scape the boho style that you want. Even that’s of the Bohemian accent you add to the room, it will be enough to brighten up space. Tassels give that subtle but characteristic accent of the Bohemian decor. So if some hint of boho in your bedroom is all you want, get these bedding covers with tassel fringe. 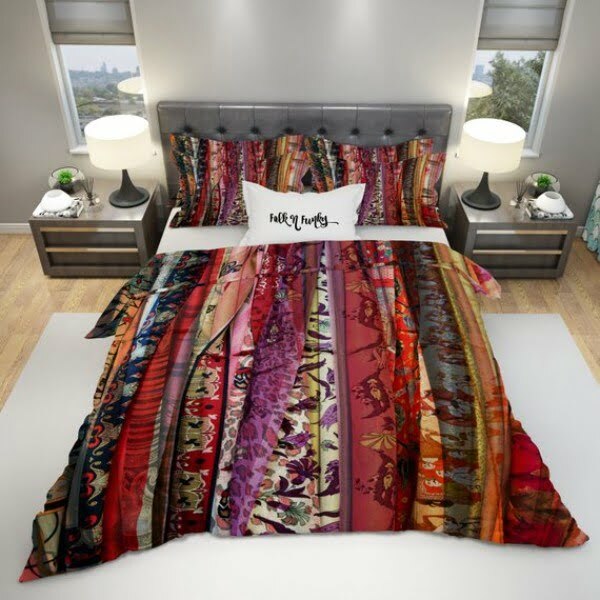 Draped over the bed, they will add that touch of eclectic style to your place. This mid-century eclectic bedroom has a lot of going on as far as style and decor. On the one hand, you have the mid-century furniture with its elegant lines, on the other hand, you have the eclectic pattern rug and wall hangings that turn the place in a boho paradise. Modern design meets chic boho accents in this bedroom decor. 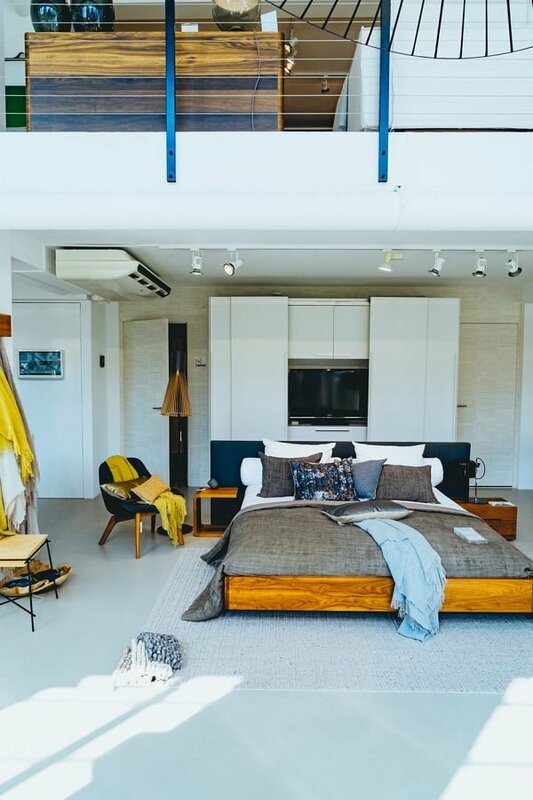 The clean lines of the contemporary furniture set the theme for the room, but the rustic platform bed, and generous use of pattern and tassel fabrics add the cozy chic Bohemian touch. All in all, it’s a great example of how you can add some boho to your modern room. Few things channel the boho spirit more than an eclectic mix of textures and styles. 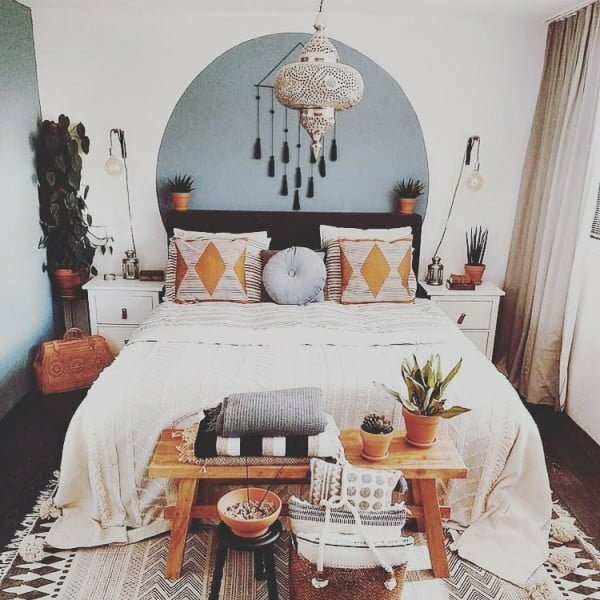 This bedroom mixes different styles and mediums like bedding, artwork, rustic furniture, and lighting for the ultimate boho-chic look. The boho look can be hippy, exotic, or eclectic. This bedroom brings an exotic Tuscan flair to the boho style with the fabric-draped canopy beds and the patterned accent pillows. A vital aspect of the boho look can be achieved with layering. 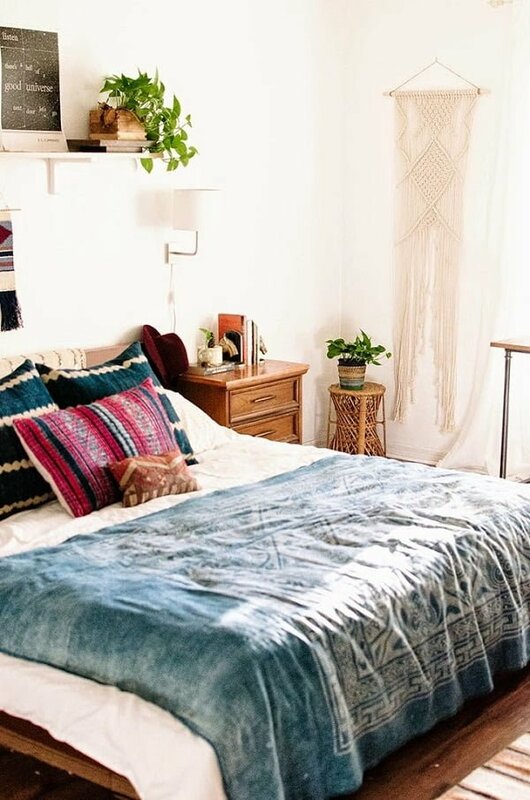 Having some different textiles in a bedroom with bedding, throws, and pillows lend itself well to the natural look of a boho bedroom. The boho look is brought to life with the blending of a variety of fabrics and patterns. The fabric mounted behind and above the bed gives the allusion of a canopy bed, while the netting adds another element of texture and style to space. Few things scream boho more than a trendy ashram-like floor seating area marked with a rug, low accent table, and comfy pillows. 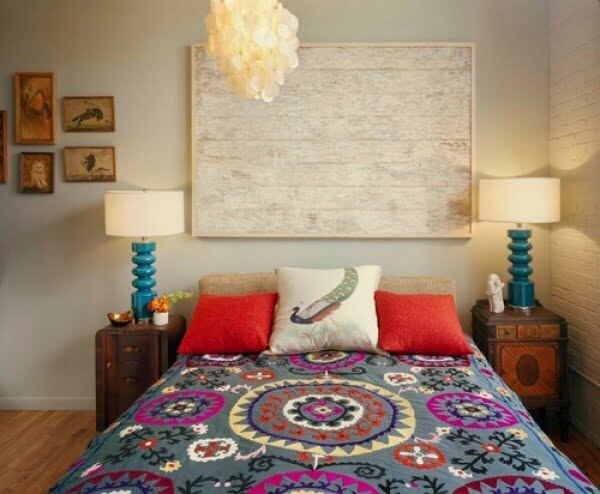 A boho bedroom is easily achieved with the layering effect of combining many textiles. 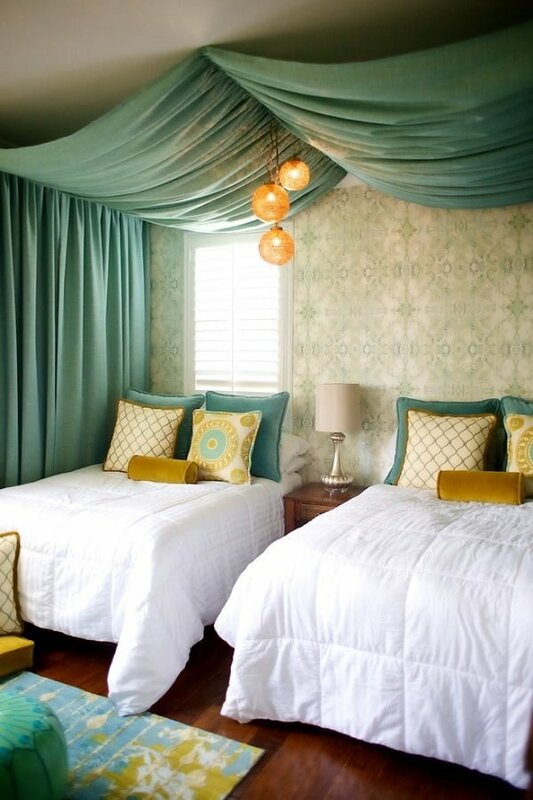 The bedding, canopy, curtains, and fluffy pillows easily cultivate the cool casual vibe. Part of the charm and appeal of the boho style is using items in home décor that have different uses. 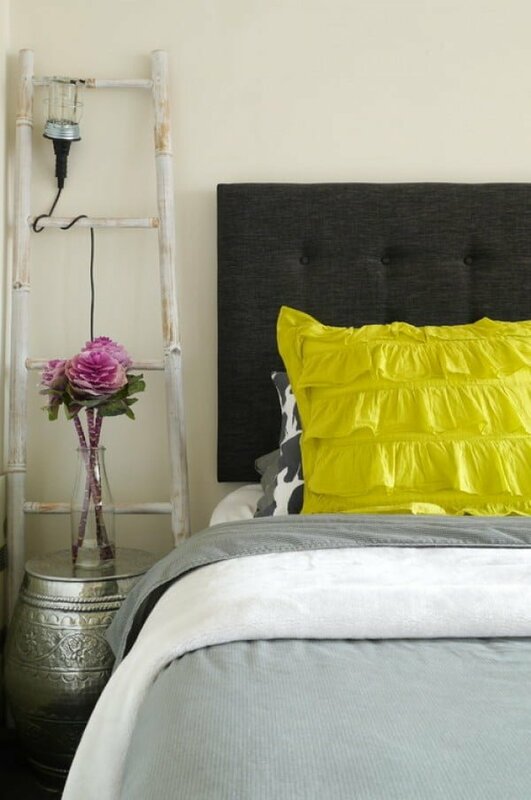 Using a hanging work light instead of a traditional bedside lamp with a ladder and stool to frame the bed is boho styling at its finest. 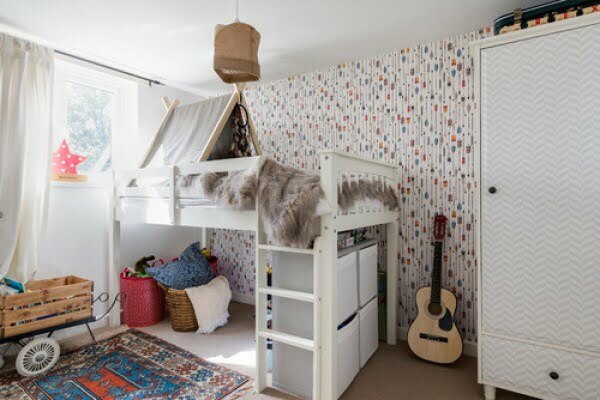 Adding some whimsical wallpaper to a child’s bedroom is one of the most effective ways of bringing the fun and carefree spirit of frivolity to space. It also helps clearly define a focal wall. 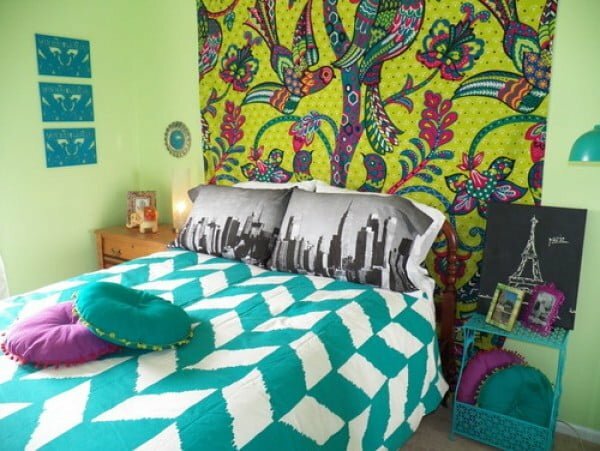 Combining a multitude of vibrant colors is characteristic of the boho look, and this bedroom nails it with its vibrant color palette. The bedding, behind-bed art, and NYC-image pillows combine some mediums to create a strong, chic atmosphere. When many people think “‘boho,” a thick woven macramé wall hanging comes to mind, and luckily, they are back in style in the world of home décor. 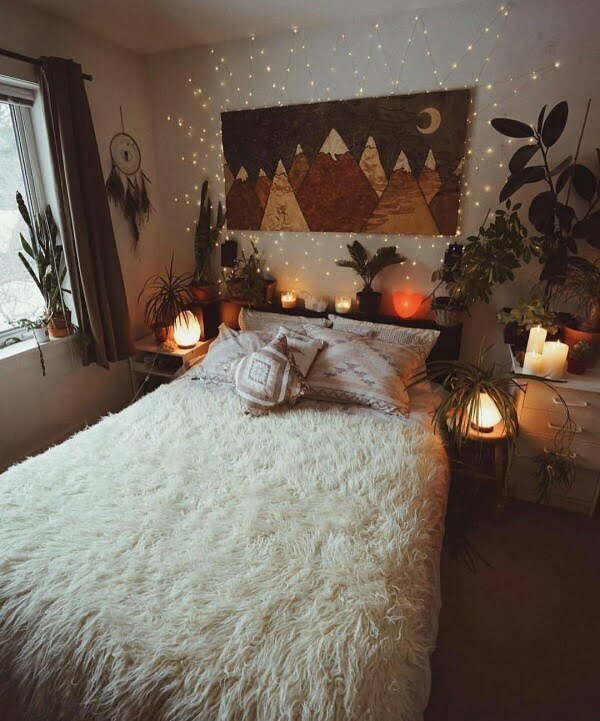 A cozy, intimate, casual vibe is created with some atmospheric twinkle lights behind the bed and lots of greenery to warm up and unify the space. 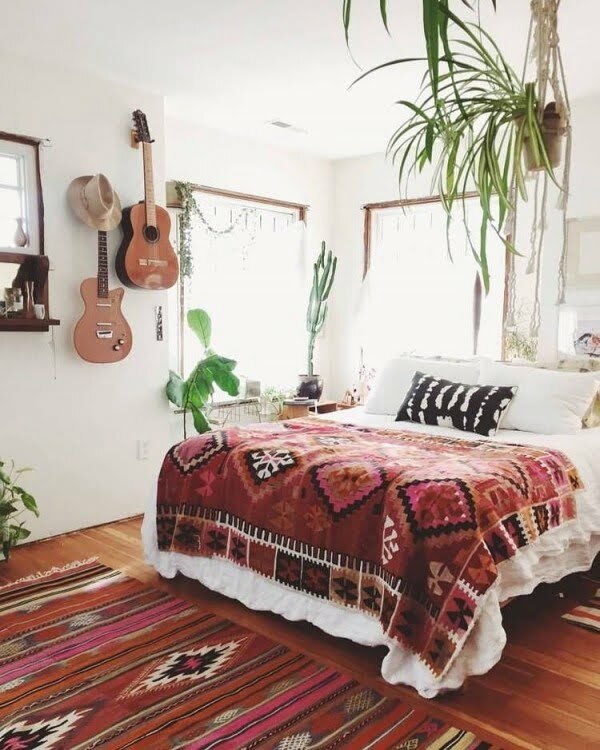 Hanging plants in dangling macramé hangers paired with hanging musical instruments on a bedroom wall make for some great boho décor. 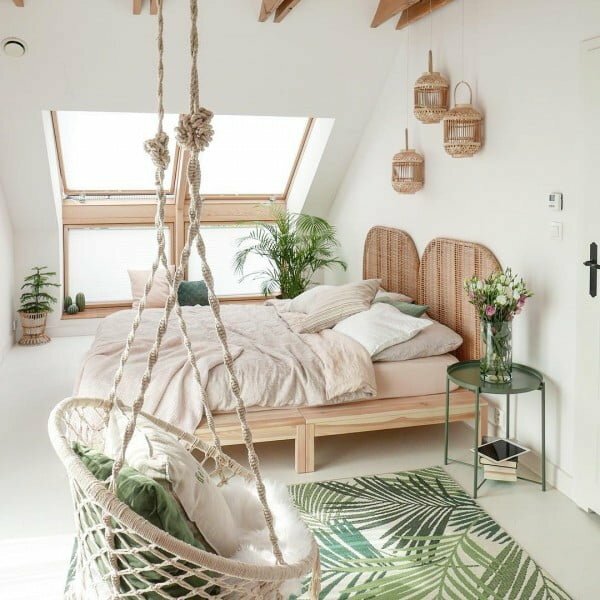 Exposed beams, lots of white, a whimsical hanging seat, and wicker and baskets galore give this bedroom a light and airy feel that is both relaxing and refreshing. 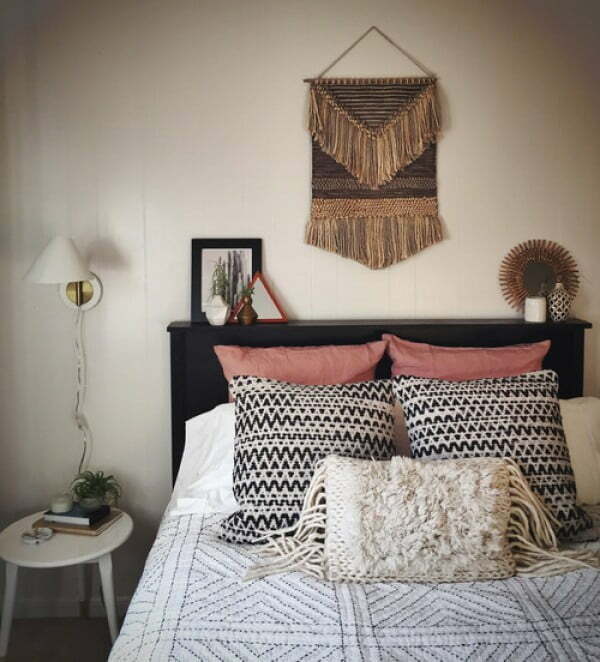 Hanging a color-blocking yarn wall hanging above the bed is a fresh and unique way to frame out the bed and create a focal wall in a boho bedroom.